Landscaping is becoming increasingly expensive and for some of us, these are unnecessary bills. You have your trusted lawn mower to keep the lawn trimmed and you scarified your lawn. What most trusted lawnmowers don’t do, is allow you to access those tight corners or down the edges of the lawn. The best way to approach this and keep the edges manicured is by using a good pair of edging shears. There are many variations of edging shears making their way onto the market. They have different designs, mechanisms, and additional features that can help you make garden work a little bit easier and a little bit more accessible. When immersed in the search of the best garden shears or best edging shears there are a few basics that you are required to grasp. These basics are not passed to complicate matters, rather they set out to help you make easier choices. We have done the investigations and research for you so read on to see which edging shears stand out from the rest. After studying all the edging shears provided in the market. We have come to the final conclusion that the Spear & Jackson Razor-sharp edging shears were the best edging shears in this review. The reason is that we love its light weight body but razor sharp blades. Tube shaped steel handles which are both light weight and strong. Hollow carbon steel blades for excellent cutting performance. Soft grip handles which provide extra comfort. The Babylonians were known for their beautiful gardens and most of us till today still continue to keep the tradition alive. Beautiful gardens have charmed even the dullest of souls. So in the maintenance of these gardens, we have to ensure that the tools we get are capable of doing the work. Length of handle - As humans, it is obvious that we vary in shape and size. When selecting your edging shears keep in mind your height and any health limitations. It is advised that you measure your estimated height and work out the possible length of shears that is comfortable for you. Tall people tend to stoop while using garden shears that are too short. This causes back problems in the long run and can make the job much more uncomfortable. There are brands in the market that offer telescopic shears to their customers. This telescopic feature is there to make sure that the handle is adjustable. An adjustable handle means convenience when working around your garden. It means that anyone who comes into contact with this telescopic edging shears can use them since they are adjustable. They usually operate within the range of 640mm to 1.71m. They are also easier to store. Blade quality - We all appreciate the look of a crisp cut lawn that sprawls for days. To get this crisp cut it means that the blades on your edging shears have to be very sharp. Well sharpened and maintained edging shears do not need constant adjusting. The blades are made of the highest quality of material. This way, the shears can withstand the constant use and also the wear and tear that comes with climatic conditions. Blades that guarantee to be hardened and tempered in most cases are of very good quality. This process of hardening and tempering is meant to harden the metal but still, make it malleable and supple enough to survive tension. Some blades being marketed feature the ‘self-sharpening’ mechanism. The secret to these edging shears is that the blades are designed to be positioned at an angle. Whenever the shears are in use, the blades rub against each other and cast out any imperfections that may cause the blades to be blunt. Look out for the length of the blade. Shorter blades are known to weigh less than the longer blades. On the flip side, however, these long and heavier set blades are excellent at handling longer grass. Longer blades have the added advantage of coverage so you get to finish your work quicker. Weight - The material that fashions the edging shears that you are after should be light. Why? because you do not want to get exhausted before the work is done. Although heavier set edging shears provide support and sturdiness while working, they can damage your back and cause you to stoop. Aluminium made edging shears are known to be lighter. Materials such as wood and steel are generally more damage resistant but weigh considerably more. Price - Your spending power pretty much sets what you can get or miss in this world. This is no different in the world of edging shears. There are brands in the market that offer you excellent shears but for a considerably higher price than others. The good news is that manufacturers design good products for every price range. What differs are the features available. Think about how much you are willing to spend and purchase the best edging shears within that price range. If money is not a problem, then you can have the best the market has to offer. A good pair will set you back around £30 with better models costing over £60. These edging sheers are far more superior than other model we have ever reviewed, the quality is above and beyond what most gardeners expect. Drop forged, tempered and hardened blade. The sharp blades on this edging shears will make you excited every time you go out to groom your garden. As iterated before, sharper blades make for neater more beautiful lawns. The blades on this product are made from carbon. Carbon is used as it gives off a light feel and will always be supple enough to withstand the constant wear and tear. Now you can spend hours grooming your garden/lawn without feeling like you are completely exhausted. Your arms will thank you for this. Due to the fact that edging shears are used outdoors, it is crucial that they are able to survive the weather conditions pertaining to your area of residence. The Spear and Jackson razor sharp edging shears have weather protection measures. They have been slathered with layers of polish and lacquer. The layers will deflect moisture that usually causes rust which eats away at the sharpness of the metal. You can be sure that your edging shears will last for many years to come. While working you don’t want to have blisters on your hands. After a long day maintaining and grooming around your garden, you want to be able to still use your hands. These Spear and Jackson edging shears are designed to offer you a soft grip that won’t make your hands rough with blisters. The tubular handles are created that way to offer more support while working and comfortable fit. It is easy for the arm to go around the handle and move in any given direction that is required. Very strong carbon steel blades which are hardened and tempered. Lacquered PTFE coated and polished blades for extra protection against the elements and better cutting performance. Soft grip handles for extra comfort. May be more difficult to use for smaller gardeners. For such an affordable price you get yourself a pair of quality edging shears that really are hard to beat. Overall the are brilliant which is probably why they are one of the most popular pairs on Amazon. We really like them and have no problem recommending them.? These are a great choice for most gardeners which is why we named it our 'Best Pick, however smaller gardeners might want to consider? the telescopic model which we have reviewed further down as they may find this model a little more difficult to use because of there overall length. Most gardeners though will appreciate them not being to short. Your garden or lawn might be designed in such a way that you have to work your way around pedestrian paths. The grass that grows on the edges of these pavements cannot be groomed efficiently by your lawn mower. That is why the Bahco ? 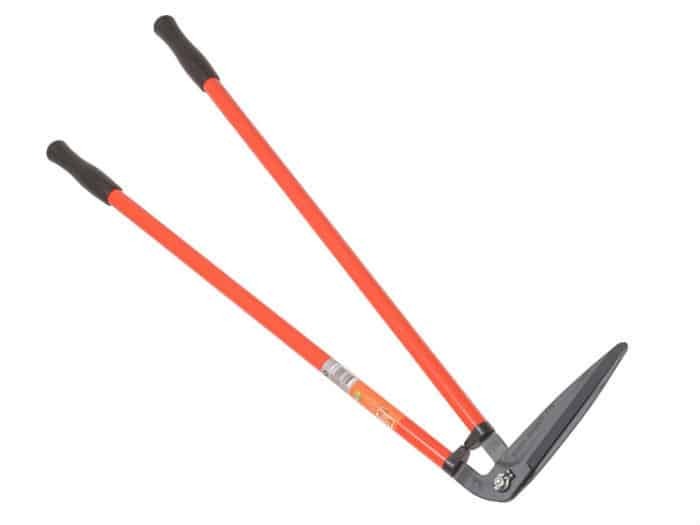 ?P75 Edging Shears can be a great help around the garden. The blades are designed to get to hard to reach areas. You can trim your edges neatly and stand proudly at the beauty of your lawn. The blades have been treated to withstand the abrasive conditions that the weather presents over time. The steel has been hardened and tempered. This is assurance that the blades will perform under stress and not break.it is coated with the compound Xylan which acts as weather resistance and a form of lubrication which helps prevent jamming when in use. In addition to the sharp blades that are able to cut through things with ease, the Bahco P75 has an amazing locking mechanism. The nut and the buffers do have a retaining self-locking mechanism which prevents them becoming loose, a problem commonly associated with cheaper models. The blade is able to absorb the physical shock or impact for when the blade come into contact. Jarring can usually make working uneasy since you have to brace yourself for impact all the time. We all know that working at certain positions may cause strain on the different part of your muscles. You end up with a sore back at the end of the day due to stooping too much. Stooping may be caused by using edging shear handles that are too short. 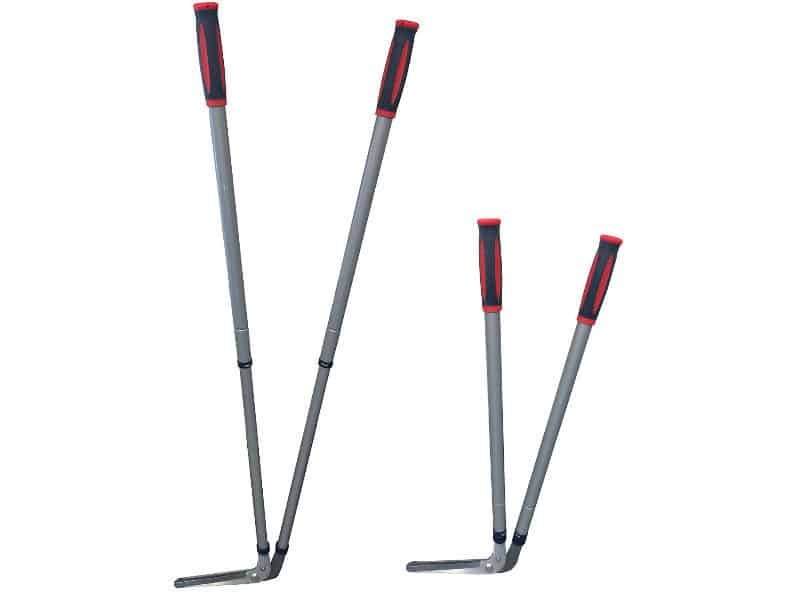 The Bahco has handles that are appropriate enough for most people to operate comfortably. Your hand can enjoy comfortable grip as you manoeuvre through. At 1.6kg, Its not too heavy to cause you physical distress while working which is a bonus. Can access hard to reach places. Coated to protect from rust and reduce friction. Self-Locking mechanism to prevent blades becoming loose. During our research we noticed that some gardeners had commented on the the joint holding the blade can sometimes get loose and need tightening. This was not common but something worth looking out for. Also, the blades may not efficient enough to cut long grass efficiently so best used on lawns that are cut regularly. The Bahco P75 Edging Shears are affordable edging shears that will provide you with good service if looked after correctly. They are budget friendly which is why they are our 'Lawn edging shears best buy', overall we do really like this model which is why we included them on our best edging shears list. What we do like is that if, the blades become loose, you can tighten them again sing the self locking retaining nut, this is something you cannot do with models models, meaning once there loose, there loose with no option to tighten them which seriously impacts there performance. Overall a great pair of edging shears, it's worth noting that Bahco is also well known in the trade for quality. The C.K 5051 edging shears are very interesting. You might wonder why. Let us explain. The shears have very sharp blades that are capable of handling heavy duty work with very little effort. The blades have undergone several treatments to make them stronger and more durable than most other models. You need blades that have been hardened and tempered and drop forged to get premium cutting performance. The blades on the CK 5051 are hollow ground, these type of blade is usually used on very sharp expensive knifes. This is what makes them so expensive and why most manufactures don't use this type of blade. If the blades are too heavy, they exert unnecessary pressure to your muscles thus unnecessary strain. Hollow blades weigh less and can be manoeuvred easily and are super sharp. The blades have also been plated with amour chrome coating. This is just as a protective feature. The blades will be under constant exposure to different textures and conditions. The rain is an enemy for most gardening tools when left over exposed. When working sometimes you need different tension to cut through different plant material. You can enjoy the adjustment settings on this edging shears. You can easily set the amount of tension you need with this model. The handles are made of hardwood which is durable and can withstand a few bumps and bruises as well as being very strong unlike some plastic handles. The edging shears weigh a bit more than the rest but this is worth the trade off when you take into account the exceptional high quality and cutting performance. This may be due to the fact that edging shears on the heavier side are more capable of handling tough work and ideal for professional gardeners who use their tools a lot and want to invest in the best garden tools. The ease at which you cut the grass on your lawn may not be applicable when dealing with slightly thicker textures. The blades have low friction mechanism that makes cutting a breeze. With the right tension, you can achieve grooming your property and sharpening your favourite edging shears. ‘drop forged’, tempered and hardened blade. Amor coat chrome plating included. Hollow ground blades which are super sharp. This high performance edging shears are of very good quality. The only disadvantage is that it can be quite heavy compared to other models, however your trading weight for quality and cutting performance which we think far out weighs the weight. 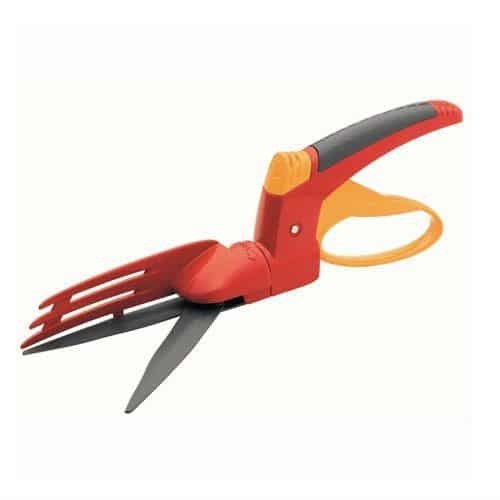 People with smaller frames may struggle with manoeuvring this edging shears around. The price on the C.K 5051 Edging Sh? ?ears will make your eyes widen a little bit but they are worth every penny if within your budget. These edging sheers are far more superior than other model we have ever seen, the quality is above and beyond what most people would expect. If your looking for the best edging sheers and have a large budget then these truly are unbeatable and will probably be the last pair you ever buy. 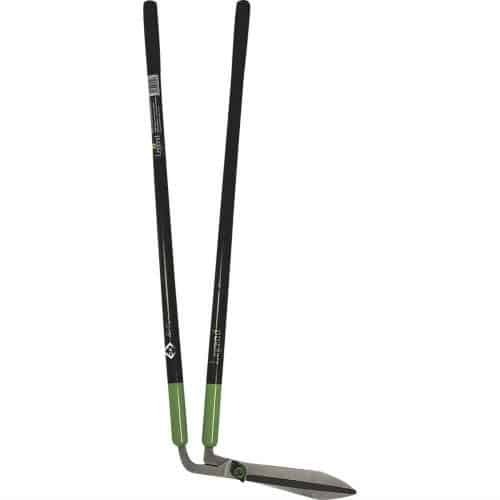 Overall, if you're a professional gardener then these are worth the investment, as a casual gardener, you may want to consider our best pick unless you have a larger budget to play with and want the only the best. The Spear & Jackson edg? ?ing shears have taken the comfortability of your posture as you work. This brand of edging shears has adopted the telescopic handles feature. That means whether you are short or tall you have the ability to use this shears. The handles are very accessible and can extend up to 1.14m. You can escape doing garden chores for a while and let your spouse handle it. The handles are of tubular design so that you can move your wrist around comfortable to tackle those hard to reach corners. The edging shears are not heavy to work with. They are even light enough for you to transport them around if you are a professional landscaper. The blades on these shears are very commendable. They are made from C50 carbon- steel combination that makes them light and manoeuvrable for use. They blades are light enough to access plant material that is usually hiding under thickets. You can trust that these blades will give your lawn that manicured look. To protect the edging shears just in case you leave them outside, they are polished and lacquered. These materials are meant to protect the blades from dust and rust. The product comes with a lengthy 10-year guarantee that is to signify that the manufacturer trust in the quality of product that Spear & Jackson are putting out. ?The Spear & Jackson Razor-sharp Steel Telescopic Edging Shears are a good investment. They do not cost much and they are considerably lighter than some brands featured here. They are perfect for around the garden and we really like the telescopic handles which can be set to your desired length, this is great for anyone who needs to share them and require different length handles. Overall a excellent buy and good all round with the added bonus of the 10 year guarantee. Like most of the edging shears in this review, the blades are made from the best material available in the market currently. The blades are durable and strong enough to handle most of the grooming activities around your property. The blades can be easily sharpened and cleaned. Dirt is among the top reasons why blades loose their sharpness overtime. Just as a precautionary measure, the blades were passed through more treatments. The blades are coated with PTFE which acts as a rust forming a barrier. You can enjoy smooth cutting due to this coating. The Spear & Jackson 4870RS have long handles which are very encouraging for people around the average height and taller. The handles are made of durable and high-quality material that can withstand consistent daily use. The handles are of tubular design just like most of the shears in this review. When it gets hot our bodies have to dispel the heat somehow. The skin around your palms tends to be the first area the skin uses to dispel of heat, and this means sweaty palms. Sweaty palms make gripping handles a bit tricky. If your shears are heavy, you might have a hard time holding on to your shears. The Spear & Jackson 4870RS has put in measures to prevent this. The handles have non-slip material around them. So you can work through sweaty hands without struggling. Hardened and tempered carbon-steel blades. Overall length of 915 mm (36-inch). Some gardeners have reported that the handles may be a little bit too flexible. However most users have found them just fine. These Spear & Jackson 4870RS shears will suit those who have been looking for edging shears that longer than most makes. Taller people may appreciate the long handles this model comes with, making use slightly easier and more comfortable to use. Overall another great pair of edging shears. Here comes another great product from Bosch. The Bos? ?ch Isio is a light with cordless function is a very convenient shrub and grass shears. What you need to do with the Bosch Isio is just turn it on and let the power work for you. The sharp blades run on a 3.6V Lithium-Ion battery so you have all the power needed at the palm of your hands. The batteries offer you very compartmentalised and compact power for over 50 minutes. You can trim your edges and shrub with convenience and ease. At only 550g It's not heavy at all so you don’t have to worry about repercussions on your muscles in your arms and wrist. When working with lower levelled gardening shears you soon realise that making continuous individual cuts can be strenuous and time-consuming. With the Bosch Isio, you have shears that will offer you complete coverage and continuous cuts. The shears are designed with anti-locking mechanisms to reduce jamming. These mechanisms are in charge of getting rid of any blockages and guaranteeing a smooth finish. For effortless attachment and detachment of additional features, the Bosch Isio utilises the multi-click system. When looking to clean your shears you can easy manoeuvre around the blades. Be careful not to cut yourself while cleaning your shears. The blades are made of high-quality material that makes them strong enough to withstand constant use. You do not have to worry about the blades getting rusty as they have undergone treatments to make them weather resistant and rust free. 50 minutes of running time from one charge. Very light weight at only Lightweight 550g. Multi-click system for easy switching from grass blade to shrub blade. Uses Lithium-Ion technology 3.6V which means the battery does not loose power over winter when not in use. Sharp blades for efficient cutting performance. The Bosch ISIO Shears are expensive for such a small sized product but it can be a good choice for those who are involved in minimal grooming and older gardeners who may struggle with heavier hand tools. We do like this Bosch trimmer and its a nice little bit of kit which does have its advantages. It's more suited to smaller jobs around the garden, a little tidying up of lawn edges and shrubs etc.? As mentioned above, older gardeners may find this electric grass trimmer a big help. The WOLF-Garten gardening shears makes its debut with tremendous advantages. This grass shear is armed with razor sharp blades that can easily cut through lawn edges with ease. The blades are arranged in such a way that optimised levelled cutting. While cutting away, the design of the shears deflects the cut clippings away from the shears. This way, you have continuous and fluid motions without stalling or blockages. The WOLF-Garten shears also have an impressive feature that let you cut grass regardless of the angle. The shears have a head that can rotate 180 degrees with ease. Those hard to reach areas don’t have to be a source of contention anymore. The blades are coated with a non-stick material to aid in smooth cuts. The cut grass just bounces off the blades. The nonstick material is very easy to clean and maintain. It gives your shears an extra layer of protection. Whether for professional or personal uses, you have a 10-year guarantee if you purchase these shears. The shears are of the highest quality and the manufacturer just wants to reassure you more. Is there anything more you could ask for. Non-stick blades for easy cutting and less jamming. 180-degree rotating head for working at many angles. Has a deflector for flicking grass slipping back onto the lawn. Amazing 10 year guarantee for full peace of mind. They are inexpensive and are sharp enough to do basic grooming activities. They are however not recommended for heavy duty work for obvious exhaustion reasons. All of the edging shears in our review have their advantages and which you choose, will depend on your own needs and budget. Our best pick is probably going to be the best choice for most gardeners as it offers both quality and great cutting performance without spending the earth. As a professional gardener you may choose to go with a more robust heavy duty pair which will stand the test of time and pay for themselves again and again. Below is a quick roundup of our top recommendations. Through the information that we conclusively analysed it is clear that the Spear & Jackson Razor-sharp Edging Shears are the best edging shears in our review for most people. They are affordable and provide crisp clean cuts. They are robust enough to handle major activities and they don’t weigh too much to cause discomfort when using for longer periods of time. For this reason these are a great choice for anyone looking for a decent pair for home use. In our educated opinion, the C.K 5051 Legend takes the award for best heavy duty shears. These edging shears are strong enough and heavy enough to undertake some of the heavier handed lawn trimming. It is weather resistant which is important for long term use in all weathers and the tension can be regulated for optimum performance. If your a professional gardener, these are ultimately the model that makes the most sense and will offer excellent value, despite the heavy price tag. These really are the best of the best. This title is taken by the WOLF-Garten shears that can efficiently manoeuvre its head to cut grass at whatever angle which is an amazing feature on its own. They are inexpensive and is sharp enough to handle lightweight grooming in your property but robust enough for professional gardeners to use. They are the best edging shears without being motorised and want cost you the earth. We also like the 10 year guarantee for peace of mind. We hope that this has been relevant and insightful to you. We hope we have helped guide you successfully to select the right edging shears for you. That is all from us for now. Be sure to add any suggestions or information that might have been left out in the comments section below and give your thoughts and opinions. Response to "Best Edging Shears For Your Lawn – Chosen by professional gardener"
At start of review you show edging shears that are flat on the grass.could not see these in the review.can you let me know where to get them.